We heard great stories from the younger players, and many of them are already playing very well in spring training Red Sox games. Every player stayed for autographs, photographs and enjoyed the evening. It was a memorable event, as always. To those who were not able to make it to Spring Training this year, we hope to see you next year. It is a special time at Fenway Park South, a great way to celebrate spring and the best way to see baseball. We'd also like to share with you a story about a young lady who's been coming to Spring Training since she was very young. Today, she is a college student in Washington, DC spending the summer at an internship. She applies to the Washington Nationals for a baseball position. Low and behold, she is now a 2017 Ball Girl for the Washington Nationals. 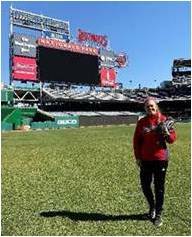 So, if you're at a Nationals home game, say hello to BoSox Club President, Mike Vining's daughter, Alicia Vining. She makes her debut on March 31 at 4:00 pm when the Red Sox play the Nationals. She will be on the third base foul line, in uniform. If you watch the game, be on the lookout for Alicia! Congratulations, Alicia! If you have a story to share with members, we want to hear it! Please email Debbie at d.courteau@verizon.net, and include a picture if you can.